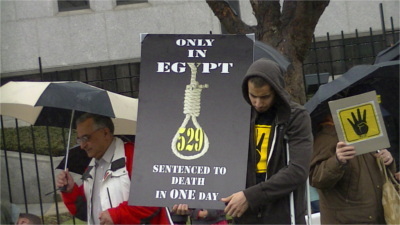 On the 29th of March, Egyptians showed up at the Embassy of Egypt to protest against death sentences given to 529 protesters. 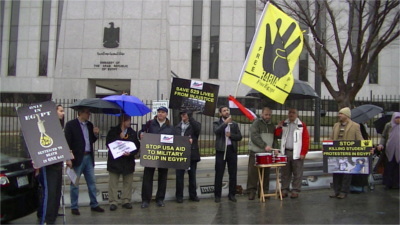 Even some secular opponents of the Muslim Brotherhood participated in the protest at the Egyptian Embassy, as Sisi's crackdown is widening and who knows who else might face execution if these death sentences are carried out? Sisi's military government claims the death sentences are because of the killing of a single cop during protests last Summer. Thousands of people were killed by soldiers and police during those same protests! With this kind of behaviour, the coup government in Egypt is reminding me of Pinochet and other dictatorships in Latin America that relied on military coups (and often SOA training) to take state power. Lastly, here's a personal note: Nine years ago I too was at a protest where a cop died. He had a heart attack while beating up a young boy for throwing ice water during the Biotechnolongy Industry Organization convention in 2005. The Philly cops tried to charge everyone arrested at BIODEV that day with murder (like in Egypt now) but unlike in Egypt the judge threw out the charges the next day.